Recently, I have found myself in a bit of a food rut. I always gravitate towards the same weeknight dinners because they are convenient and easy to prepare. While it's great to have a few go-to meals, it can get quite boring eating the same meals too often. Luckily, I came across this new recipe that had me excited to get cooking in the kitchen. This tasty and satisfying side is not only healthy, but super flavorful. Not to mention, the pomegranate seeds add a hint of sweetness and pop of color to the nutty dish. 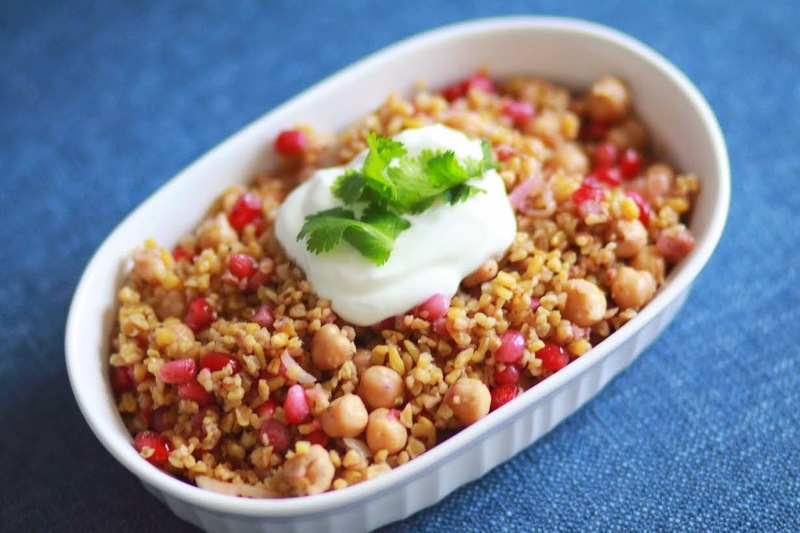 Cracked freekeh can be substituted for whole. In a medium saucepan, bring freekeh and 3 cups water to a boil. Reduce heat and cook until tender for about 45 minutes. Drain and transfer to a bowl to let cool. Heat 1 tablespoon oil in a skillet over medium-high heat. Add cumin seeds and stir until fragrant for about 30 seconds. Then, add pepper flakes and shallot. Stir until deeply caramelized, which will take about 2 to 3 minutes. Season with salt; transfer mixture to bowl with freekeh. Toss in lemon juice, cilantro, and pomegranate seeds. To serve, dollop each portion with 1/4 cup yogurt, then drizzle with remaining 1 teaspoon oil.